Ajarn Fan Ajaro (commonly spelled ‘Ajahn Fun’) was born on 20th August 2442 BE, in the Pasanikom Municipality of Sakon Nakorn. was one of the great Tudong Forest tradition Guru masters of the mid to late twentieth Century. He began in the Maha Nikai Lineage but changed to Ordain under the Great Ajarn Mun, Puritadto, and changed to become Tammayut Forest Lineage. This Great Tudong Forest Master was born into a family of status with lineage, but as all living beings have to contend with, he still had many problems and trials in life, and some periods of hardships in childhood. As a young boy he was already very orderly and well kept, and was very diligent and engaged in all his duties and chores. He would have great patience to endure obstacles and would remain patient, and keep working at whatever he was doing without getting frustrated. 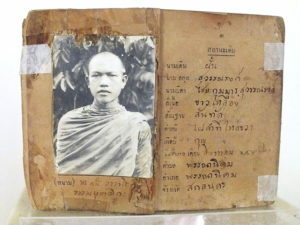 Ajarn Fan began his primary education at Wat Po Chai Temple in Muang Khai village, and accompanied his older cousin to further education at Khon Kaen Town. However, as he grew older he began to see the impermanence of seeking honourable status in the profession and in education, and decided he wanted to ordain as a Samanera Novice Monk, to follow the teachings of the Buddha. He was ordained as a samanera at Wat Pone Tong in Ban Batong, which was a Maha Nikai Lineage Temple (there are two major lineages in Thai Buddhism, Maha Nikai, and Tammayut). Some time later, in the year 2463 BE he was able to ask for apprenticeship under the Great Tudong Forest Master Ajarn Mun Puritadto , and asked to change lineage traditions to become a Tammayut Nikai lineage Monk. 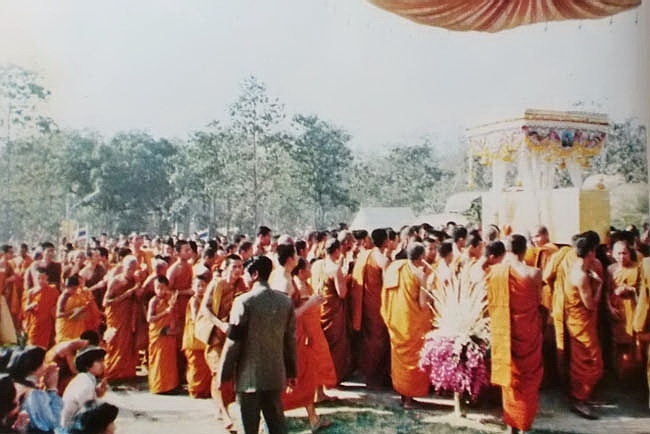 On the 21st May 2468 BE, Ajarn Fan was reordained as a Samanera Novice, into the Tammayut Nikai at Wat Po Somporn in Udorn Thani, with Tan Jao Khun Tamma Chedi (Luang Por Joom) as his Upachaya Ordaining Officer. When Ajarn Fan reached the age of 20 i then took the second level of ordination as a fully fledged Bhikkhu Monk at Wat Sit Bangkom in Pananikom, Sakon Nakorn Province, with Pra Kroo Bpong as Upachaya and Kroo Ba Ajarn Mentor. 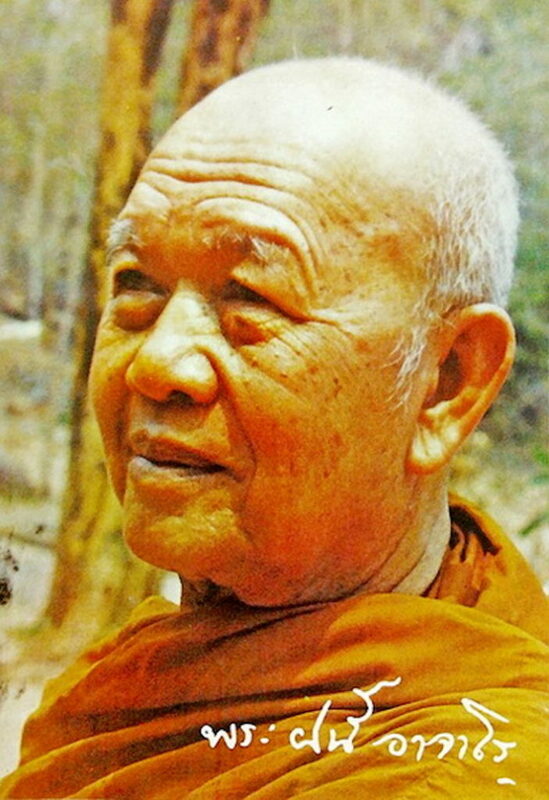 He learned to practice Kammathana Vipassana methods of Mindfulness Meditation throughout the first year of his ordination there with Pra Kroo Bpong, and when the rainy retreat was over, he traveled back to Wat Pone Tong, where Pra Kroo Samonagij was the abbot at the time, who was a Vipassana Master. Pra Kroo Samonagij took Ajarn Fan on Tudong Forest wandering and taught him the Tudong Kammathana methods of practice, exposing him to the ordeals of meditation in the Jungle, Caves and Wildernessess, and Haunted Cemeteries. Ajarn Fan continued this practice continually, wandering the forests and preaching the Dhamma to the local folk wherever he went. Tis caused Ajahn Fan to be known and revered by faithful devotees around the land, and was a household name to the people of many provinces. 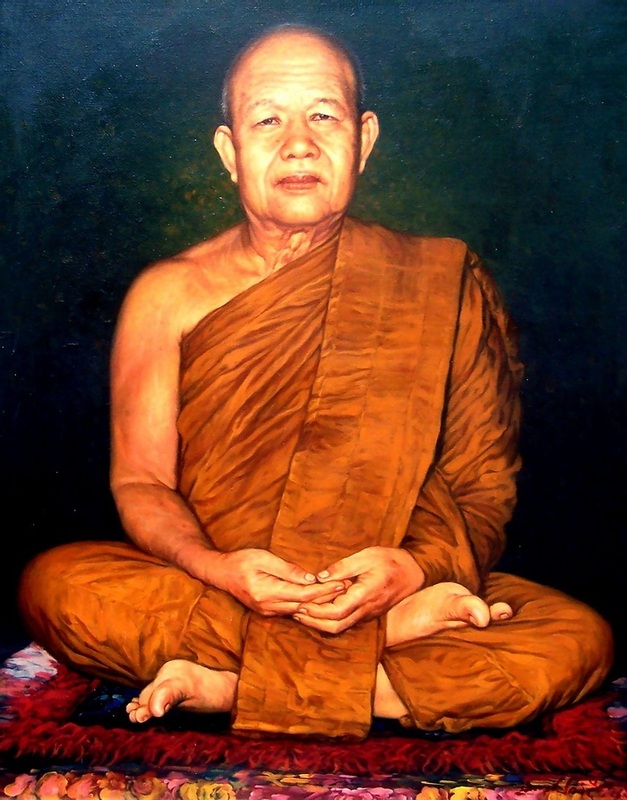 He is considered to be one of the great Arya Sangha of Thai Buddhist History, of Great Attainments and Purity. Ajarn Fan became the Abbot of Wat Pha Udon Somporn, and performed great works there until his final passing away, on the 4th January 2520 BE. 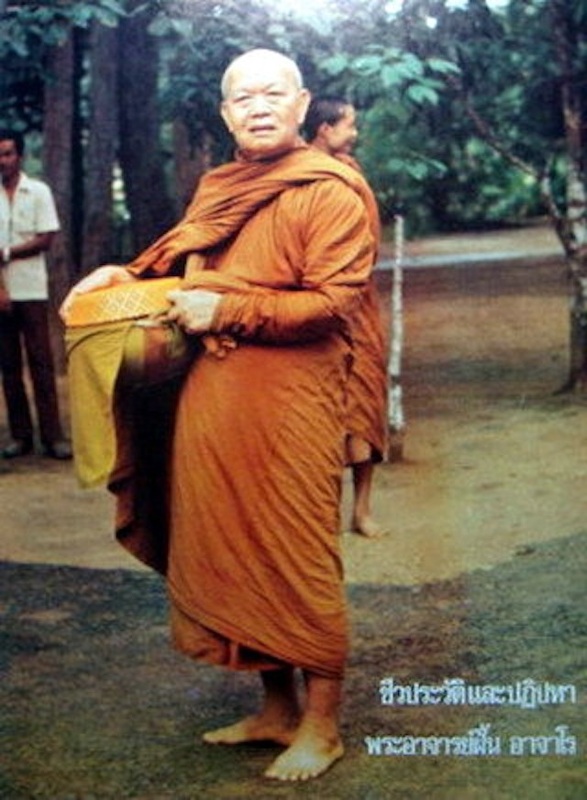 He is considered one of the top great Tudong Forest Masters of the Ajarn Mun lineage, and remains an Iconic Legend of the Temple of Wat Pha Udom Somporn, whose name is synonymous with Ajarn Fan’s himself. 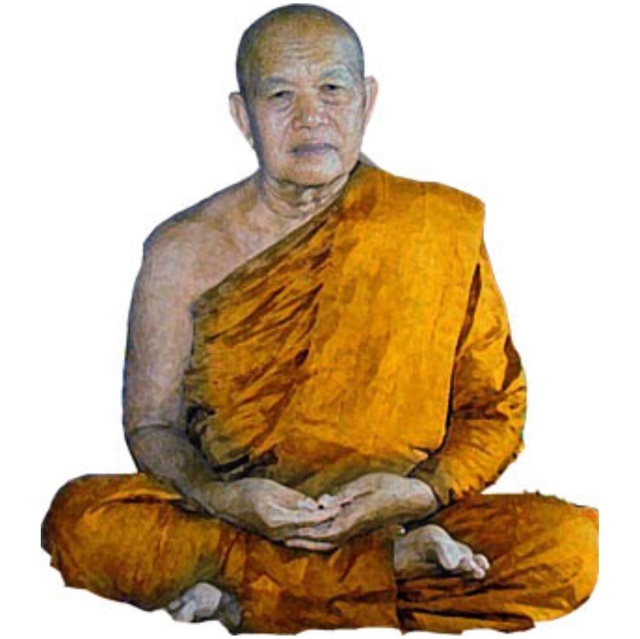 The teachings of Ajarn Fan are some of the most profound and understandable Dhamma Teachings, and are valued to be amongst the most essential teachings of the Thai Forest tradition Masters, along with those of Ajarn Mun, Ajarn Chah, Ajarn Lee, and the other Great Arya Sangha of this Lineage. Ajarn Fan would always teach that all of us will have to face a great battle one day, the battle with our own hearts, when the day of death arrives. Each one of us will have to come to terms with our lives, and battle to overcome our regrets, fears and reluctancy to accept the way things truly are. We will have to pass through that battle alone. He taught that if we resist with one thing or another, all we will find is dismay, and that the only true weapon with which we can overcome in the face of death, is with Sati (calm concentration and focused diligent one pointedness). 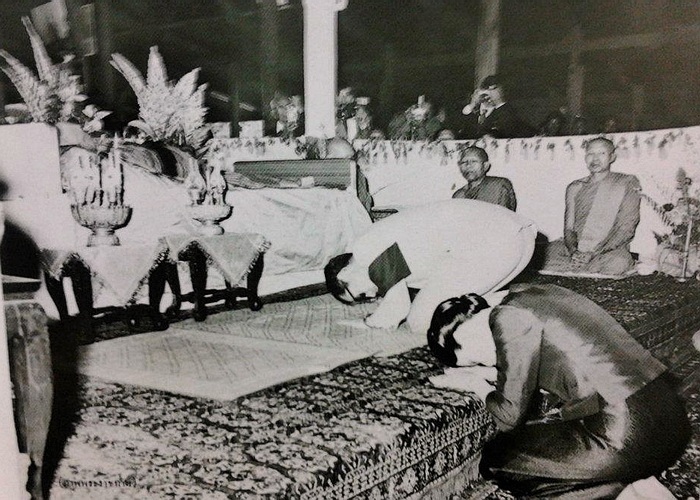 His Majesty the King and Queen Bow to Ajarn Fan’s Mortal Remains during the period of mourning. Both Royals also attended the Funeral Ceremony to Initiate the Pyre of Ajarn Fan’s Funeral. Ajarn Fan was given full stately Funeral ceremony with the country’s most important figures in Buddhism, and the Great Tudong Masters present to pay respects and farewell..
“The only true Merits we can make of any long term value, are those of the practice of Sila, Samadhi, and Bhavana” – with Moral Precepts (Sila), Concentration (Samadhi), and the Practice of Vipassana (Bhavana), leads to the power to let go of clinging to things, notions, beliefs, assumptions, and suffering. 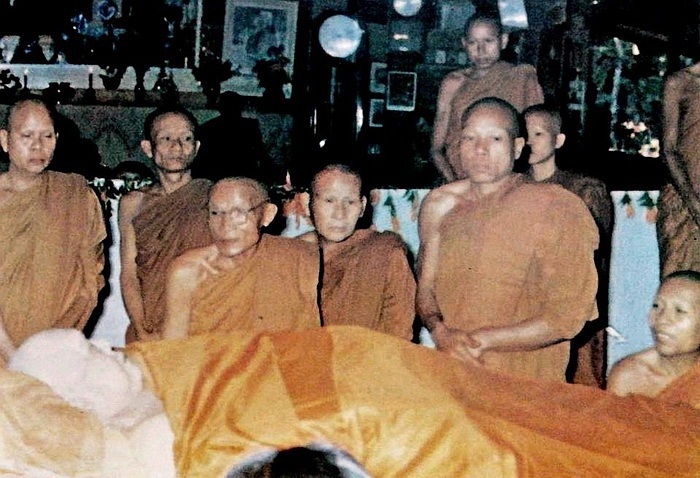 When Luang Phu Fan passed away in 2520 BE, his devotees were heartbroken, and the whole country went into mourning, including the Royal Family. in 2521 his body was finally exhumed and cremated in a Royal Funeral Ceremony, with masses of devotees, the King and Queen to attend. His Majesties then performed the Ceremonial honours. A great number of some of the Greatest Monks of Purity and Attainment of the Kammathana Lineages and Tammayut Nikai to pay respects and mourn his passing, including the Sangkaracha Sondej Prayan Sangworn, present to chant Abhidhamma, and many other Great Monks.